The tutorial was posted in 2007 in several installments. Just follow the different steps and you will end up with something special! 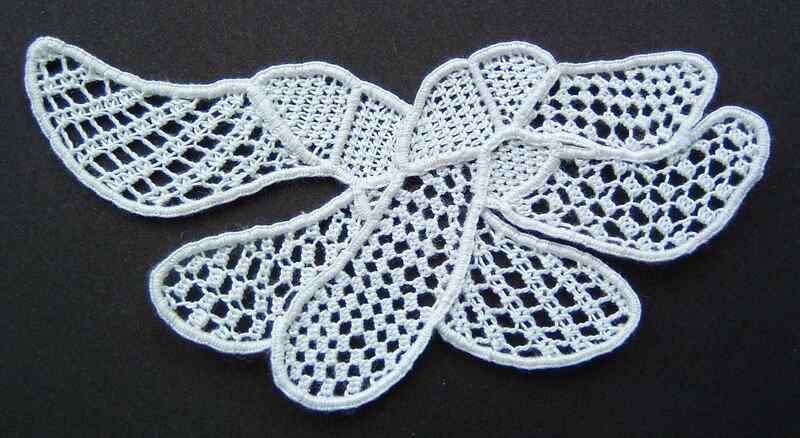 I learnt how to make this kind of lace using Starting Needlepoint Lace by Valerie Grimwood. This book is a nice modern introduction to the subject. The Encyclopedia of Needlework shows related laces and has instructions for lots of different filling stitches. The Art of Modern Lace Making presents laces based on industrially produced tapes. This kind of lace is sometimes also called “Irish Lace”. You can find my review of the book in this post. The last two books are available for free from Project Gutenberg’s Crafts Bookshelf. I cannot thank you enough. This looks amazing — everything bobbin lace wasn’t: portable, easy to hide from cats, requiring less materials, easier on the back, more interpretive and less pixelated … One could even make very large pieces by making small motifs and stitching them together, or by buttonholing them together as you go. This is marvelous! I found your fantastic needlepoint lace tutorial and I am very grateful – I am so much interested to learn it. Thank you for the needlepoint lace tutorial!!! For some reason I have the crazy idea of making the lace for my wedding gown. I was looking into supplies and was wondering if you could help me estimate how much yardage of thread I should purchase – I’d like to buy it all at once to make sure I get the same dye lot. I was thinking of buying weaver’s linen for a more formal look than cotton, but would love to hear your thoughts or opinions! Thank you again for the tutorial and inspiration! Hi Ali, not sure what to say to that. Needlelace is about the slowest method of making lace known to mankind. There’s a reason only queens could afford to be outfitted richly in handmade lace, because even when paying the lacemakers a pittance, it just took such a lot of time to make that it still was an expensive luxury. I haven’t counted how many hours it took me to make that little motif for the tutorial, but my guess would be somewhere around ten hours. Multiply that by the amount of lace you want on your wedding dress, and most likely there won’t be enough time left before the wedding even if you skip everything else. You might want to look into other kinds of laces instead, for example the appliqué technique used to create the dress for the wedding of the year by the Royal School of Needlework. As for thread, linen has been traditionally used for needlelace, but I’ve never tried to work with it so I can’t give you a recommendation. Regarding the amount needed for a large project, again I have no idea. I never finished a skein of thread for any of my small projects, but of course all those buttonhole stitches do take up thread, so it might take more than expected. Sorry, I can’t even think of a ballpark figure here. Ha! I’m trying the same thing! I’m making a lace panel for my wedding dress. But after a couple experiments in needle lace I’ve realised that you need hours and hours and hours (x1000) of work just to make a small to moderately sized piece. Eh those buttonhole stitches!! So I’ve decided to make the lace panel by hand-embroidering cotton net [http://www.lynxlace.com/embroideryonnet.html], which is a quicker way of making lace. And although it is not true needle lace, I’ll still have the satisfaction of having designed & made my own lace. Depending on the pattern you want to create, think about creating the main motifs in needlepoint with those pesky buttonhole stitches, then insert them into the cotton net. You can embroider/darn linear elements like stems, small leaves etc.into the net to unite the elements of your design. Any way you stitch it, this is not a short-term project. The kind of thing that should be begun a couple of years before you might think of a wedding. Also, consider creating a panel for someone else–a beloved friend or family member–like a panel that could be integrated into the dress or the veil. Could be a nice idea to darn in a monogram and surround it with a garland of needlelace flowers…possibilities are endless. Also a concept for a christening gown…at least you have 9+ months for that! I am learning Transylvanian needle point an would love to have more stiches in my knowledge, where can I find some? I have absolutely no experience with Transylvanian needlepoint so I’m afraid I can’t help you much. However, I’ve found Sharon B’s Stitch Dictionary an excellent source for all kinds of stitches. Thanks a lot for spending free time to write “Needlepoint Lace Tutorial � textile dreams – fibery wake up”. I think that blog is pretty interesting. Thanks for sharing these！Best wishes for you!